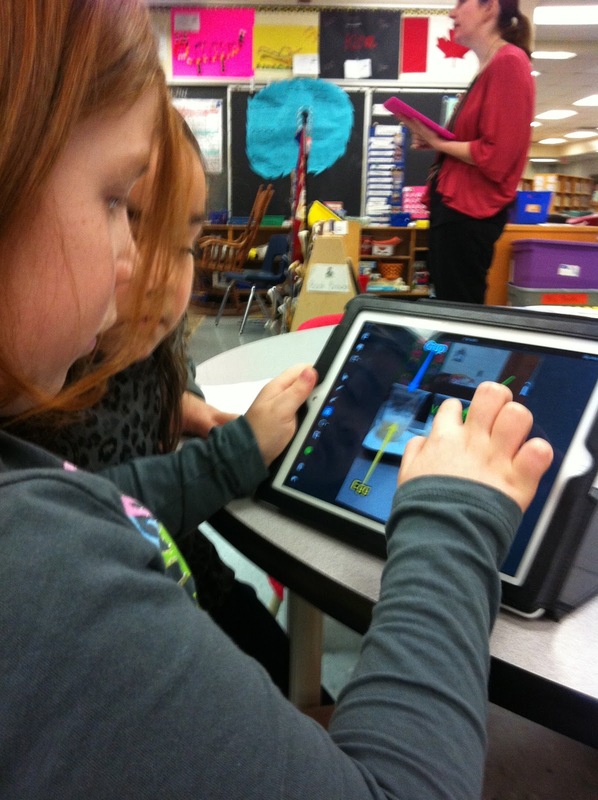 In “Innovate with iPad: Lessons to Transform Learning in the Classroom” primary teachers Karen Lirenman and Kristen Wideen provide a complete selection of clearly laid out engaging open-ended lessons to change the way you use iPad in the classroom. This article originally appeared in the Spring 2014 issue of ETFO Voice. In this grade two 3-D Geometry iTunes U Course, students will explore attributes of 3-D objects using concrete materials and drawings. Students will also build and construct 3-D objects and models as well as develop language to describe geometric concepts. Discover how to keep parents informed, connect globally and link to your curriculum. This One Best Thing leads your primary classroom students through the creation of a learning network on Twitter. Are You A Free App Addict? My name is Kristen Wideen and I am a Free App downloading addict. I have been sober for 8 months...... It all started when I received 20 iPads to use in my classroom 2 years ago. I wanted the BEST apps to use and I wanted to find the apps that produced the best learning results for my first and second graders. I downloaded apps for free and followed various Twitter accounts that tweeted out deals and details about free apps. I downloaded every free app that looked educational because I knew that I could delete it later. This led to excessive downloading and hundreds of apps that I would never use. I hit rock bottom when the message "You do not have enough storage to download this app" popped up. It wasn't because I had all this amazing work from my students stored on the iPads it was because I had pages and pages of apps that I did not use! I deleted every app from one of the school's iPads and went through all of the apps that we used on a regular basis. See, the truth is, there is no "magical app" it's what your students do with the app that makes it magical. I now try to stay away from consumption apps and use apps that let my students create. I want my students to have "app fluency." The ability to move through an app easily and smoothly. If we stock our iPads with dozens and dozens of apps then our student's never gain this fluency. I am all about choice in my classroom. I never tell my students which app to use, however I think having 3 great apps to choose from that students know and feel comfortable using is much better than 40 apps to choose from that they have no idea where they are on the iPad and how they work. My students basically have one page of "go to apps" on their iPads. We do have a math folder where there are a few apps based on the curriculum strand we are currently working on. For example, we were just working on money and time, so there are a couple of apps on those two topics. We also have a folder labelled "Research" where we have about 6 apps to help with research. Other than that, we have our "go to apps" that I want my students to use and to build that app fluency I mentioned earlier. As you can see, the majority of these apps are for content creation. I have Remarks to add notes, annotate and import PDFs, notability is also a great choice. The 100's chart is on our main screen because we use it all the time in math. It is a simple but wonderful app that my students use in many different ways. Qrafter is a QR reader, which is a must in my class. It is an easy alternative to having my students type in a url code. Which brings me to why I have the Chirp app on my main screen. If you have not used chirp, see what it does here. We then have our apps to share and collaborate with others: Kidblog and Twitter are a must and dropbox is our storage solution. Minecraft is what my students will do anything for and having a carrot like that is amazing. Have a group of boys that don't want to write? Set a timer, and have them play Minecraft for 15 minutes, then have them write about it. Voila, you have them writing about something they are excited about and they can't wait for the next time to write. I have a few students that never seem to get anything finished. I told them that if they complete their work they can stay in for recess and play Minecraft. I am now in the process of organizing a Minecraft club because it is so popular. This is the reason, Minecraft is on my main page. The rest of the apps are content creation. However, if I had to choose just one app for content creation it would be Explain Everything, hands down. 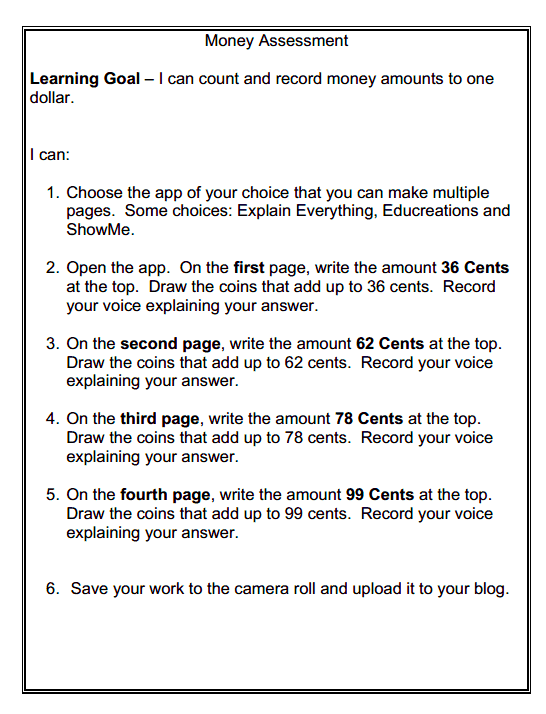 This is your everything app and it is the most popular app with my students for sharing their learning. Will you see Explain Everything on Apps Gone Free? Probably not. Most if not all of these apps will not be on those sites because they are high quality, tested and popular apps. Do yourself and your students a favor, go through the apps on your iPads and start fresh in the new year. Don't be the teacher that says, "I have that app somewhere" as you flip through page after page on your iPad. I challenge you to get down to 2 pages, without multiple folders. Encourage app fluency. Instead of being mediocre at 40 apps be fantastic at 10. Twitter is an invaluable tool in my classroom. It hasn't always been. In this post, I want to point out some of my mistakes and how I overcame them to help you and your students be successful with Twitter. The Teacher creates and publishes the tweets. When I first created my Twitter feed, my purpose was to share what we were doing in class. 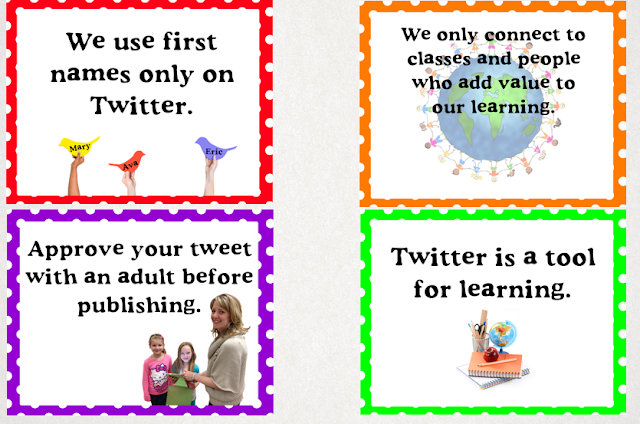 I created the tweet, took the pictures, responded to tweets, and shared the feed once in a while to my students. Who owned the learning? Certainly not my students! The way I rectified this was that I sat down with my students and we created a new Twitter handle (@mrswideensclass) and I kept the current feed as my professional Twitter handle (@mrswideen). Instead of me tweeting about my students, my students are now tweeting about their learning and have created their own meaningful connections with peers, as I had, through my personal learning network. Jumping right in without laying the ground work first. Leaving the parents out of the loop. The purpose of Twitter is to CONNECT with others. If you make it difficult to connect with other classes, then you are defeating the purpose of Twitter. Now, I am not saying you follow anyone and everyone that follows your class. My students and I choose who we follow very carefully. 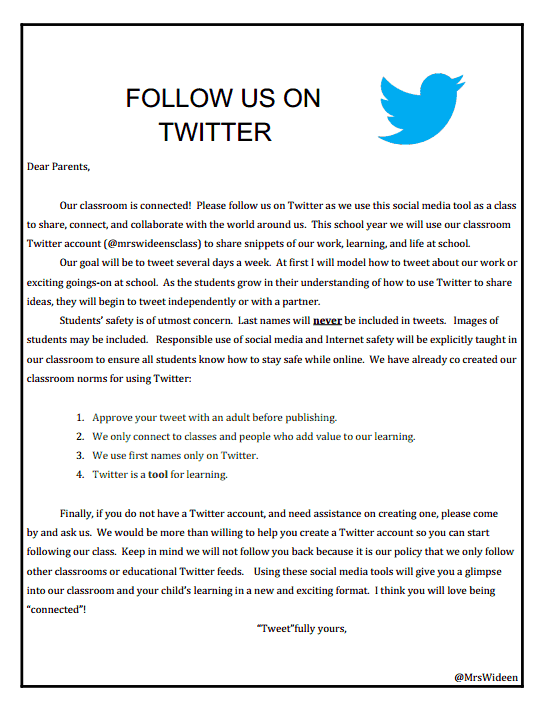 We follow classes that tweet themselves, add value to our learning and that use Twitter as a tool. We also love the adults that follow us because they help answer our inquiries and push our thinking. Twitter expands learning possibilities by making instant connections to a global community. Sharing perspectives and opinions about the topics my students care about builds writing skills and improves research skills. We are just finishing up our math unit on money. I teach grade 2 math, so the expectations were that students would be able to count coins up to one dollar. We had to start right from the beginning with money. Many of my students were unable to name the coins and tell me what they were worth. In this blog post, I am going to highlight some of the activities we partook in over past couple of weeks. Small group instruction is key in my math classroom, so I try to give activities that I model first, then students can work independently while I work with the students that need the extra help. Like I said before, some of my students couldn't name the coins and others knew their value. 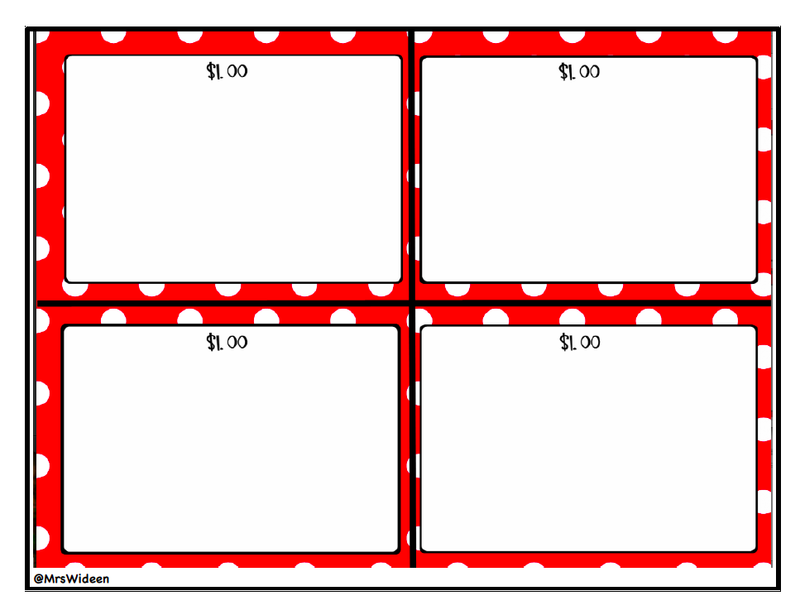 I decided to have the students create a money book on the iPads using the book creator app. Some students made a book about each coin while others were given set amounts that they needed to show in their books. They also needed to record their voice and talk about each page, whether it be explaining the coins and how much they are worth or counting the coins that represent a certain amount. Here are three examples from three different books. 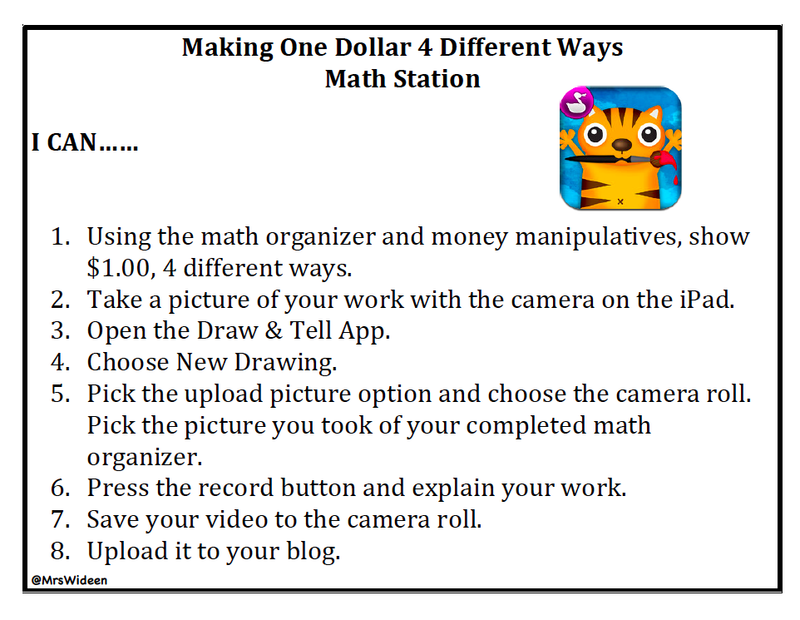 Another activity students participated in was a money Math Station that I used last year when I taught grade 2 math. 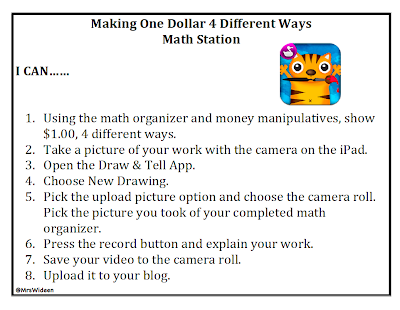 For my students that were not ready to make a dollar four ways, we used sticky notes to cover the amount and wrote in a different amount that were challenging for them at their level. My students also created money questions to share on our class Twitter feed for other students to answer. Here is an example from one of my student's blogs here. Instead of giving my students a written test at the end of our unit. I had them show their learning using a content creation app. I think is a far superior way of seeing and hearing what your students can do rather than a paper pencil task! I love the following example because my student makes a mistake on the second slide and you can hear him thinking about what he is doing and fixes it! What are some ways that you teach money in your classroom? Sign Up For The January Blogging Community Session Now! What is the Primary Blogging Community? 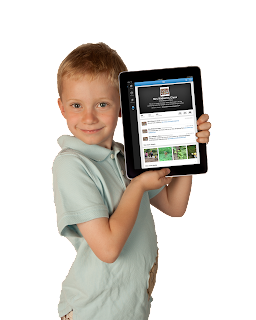 The PBC is a community of primary teachers (children aged 5-10) that want to share their students' learning via their classroom blog and their students' personal blogs. Classrooms will be grouped with 3 or 4 other classrooms from around the globe. The program is 6 weeks long. The first 2 weeks will concentrate on the classroom blogs only. Each week, two of the classes will be the focus classes and the other 2 classes will be visiting and commenting on the two focus class blogs. The following week, the third and fourth class will be the focus classes. This is a chance for the other classes to see what is happening in your school and class, to discover where in the world you are located and to learn about how to write a good blog post and to watch how you model and work together to write good comments. After the first 2 weeks, we switch the focus from your classroom blogs and concentrate on student blogs. For the remaing four weeks, the focus is solely on your student's individual blogs. Why join the Primary Blogging Community? 1. You will be collaborating with other like minded educators on this project and in return will build your PLN. 2. PBC creates enthusiasm and engagement in reading and writing. 3. It gives your students a voice and lets them be the teacher to their peers. 4. Your students will have a built in audience that will provide authentic feedback to what they are writing about on their blogs. 5. It is not uncommon to receive over on your students' blogs when they are the focus class! The excitement and engagement piece to this blogging community is huge! Each week two class' blogs will be the centre of attention. The other two classrooms will be exploring and commenting on those two particular blogs. The following week, class three and four will be the centre of attention where the other classes will comment and explore on class three and four blogs. We will have the same blogging buddies as we did in January, however, this time we will be focusing on our students' personal blogs instead of the class blog. This will create more comments, more traffic and more enthusiasm for your students' blogs. I can tell you from personal experience that on the week that my class was the "focus week" it was not unusual for my students to have up to 100 comments collectively on their blogs in one day. What is the difference between the Primary Blogging Community and Quadblogging? Primary Blogging Community - Is the exact same as above except the second 4 week cycle we concentrate on your student's personal blogs, not your classroom blog. You need to have a classroom blog and your students need their own personal blogs. If your students do not have personal blogs, I suggest you create them or sign up for Quadblogging.net instead. If you do not have an edmodo account, I highly suggest you sign up for one and join our blogging community. This is where you can ask questions and collaborate with the other teachers in the group. The code to our group is k6uu8u. 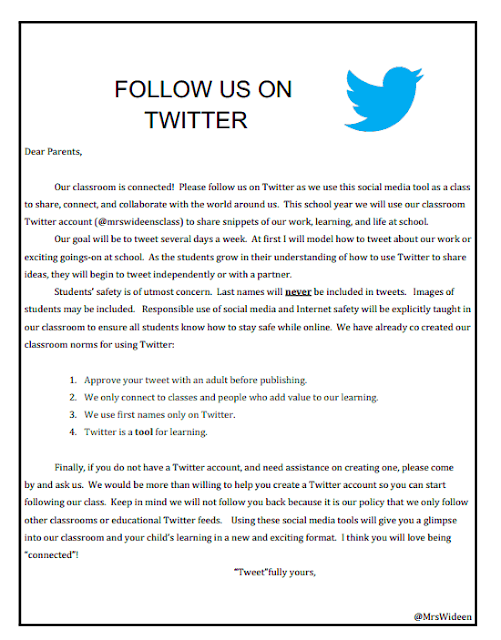 We also communicate frequently on twitter, use #PrimaryBC on twitter and follow me on twitter for news and updates @mrswideen. If you would like to participate in the January rotation, please sign your class up below. I will contact you at the beginning of January with further details.